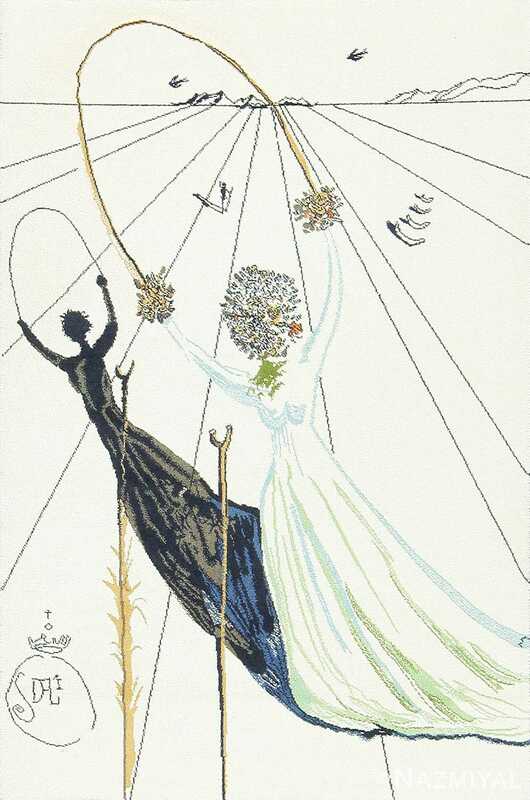 This symbolic carpet by renowned painter Salvador Dali features Alice jumping rope in a long flowing gown with her head and hands represented as bouquets and her symbolic shadow figure beside her. Vintage Salvador Dali Alice in Wonderland Rug, Country of Origin: Denmark, Circa Date: Mid-20th Century- As an admirer of Sigmund Freud, Salvador Dali is known for using symbolism and recurring objects throughout his works. This symbolic Salvador Dali Alice in Wonderland rug features Alice jumping rope in a long flowing gown with her head and hands represented as bouquets and her symbolic shadow figure beside her. Dark grid lines set over an ivory field fade to a vanishing point behind the mountains in the distance. Birds, abstract figures and a smaller secondary person dot the background in the distance. Dali’s signature and his original crown symbol are woven in the lower-left corner.